Join us at The Slade Rooms for a celebration of the 50th Anniversary of the SLADE! The daylight hours will be littered with quizzes, exhibitions, acoustic sessions and all kinds of fab and funky stuff, whilst the evening will feature none other than the awesome SLADE UK. Slade UK deliver the sounds, the sights and the power of the UK's greatest Live act. Slade! 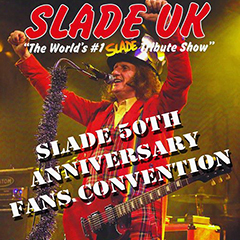 After their triumphant debut at Wolverhampton's legendary Slade Rooms in 2015 they are set to raise the roof again in 2016 as part of the Slade 50th Anniversary Fans Convention! Slade UK faithfully replicate the bawdy singalong tunes, the humour and the glam and glitter excess of Wolverhamptons finest musical export. Much more, they give you the raw rock & roll power that was the Black Country legends calling card at every live gig. Slade UK were formed to play the classic Slade songs the way the band themselves played them - Live. The set list is a glitter strewn journey through Slade's glam rock anthems of the 70's right up to the rock revival hits of the 80's. The band members are all seasoned pros on the tribute circuit who will give you two and a half hours of glam heaven with all the energy and power of Noddy and the boys. Please Note: Under 16's must be accompanied by an adult, no more than three minors per adult.